Term 1 ends Friday 12 April. Term 2 begins Monday 29 April 2019. Thursday 4 April 4pm-8pm in the hall. Parents and carers should have received an email for Parent Teacher Online (PTO) to make bookings with teachers. Students are welcome to attend with parents and carers. Enrolment applications for 2020 open on Monday 29 April 2019 and must be submitted online at https://form.act.gov.au/smartforms/landing.htm?formCode=1087. From early June, after the application has been processed, parents/carers will commence receiving advice from the school on the enrolment. Please note, that the order in which applications are received is not a factor in schools determining places and as a result, there is no requirement to submit your application form on the first day applications open. On Thursday 21 February the College hosted an Information evening for students and families. The event focused on a presentation about the ACT Senior Secondary System. Faculty heads were available for curriculum and subject specific information. For those parents that could not make the presentation a copy can be found here. Please be aware that our Parent Teacher Evening is on Thursday 4 April. If parents or carers have any immediate concerns about their child’s progress they should contact the College and speak to the teacher concerned. From 5:30 – 6:30, there will be a presentation on various aspects of the ACT government school college system. Afterwards parents and students will have the opportunity to ask questions and clarify specific curriculum and assessment concerns with the executive teachers in charge of each subject area. Please join us for this informative evening. New students begin Monday 4 February. Meet in the hall for assembly at 8.50 and then follow the mini timetable for the day. Classes begin for all students Tuesday 5 February, after the Year 12 assembly in the hall at 8.50. We are all looking forward to an exciting year of new learning! We are all looking forward to the Year 12 Graduation Ceremony at the AIS Indoor Arena, Leverrier St, Bruce - this Thursday 20 December! Students should arrive at 5pm so they can be seated in their groups. The ceremony starts at 5.30pm and finishes around 7.30pm. If you are keen to contribute to the governance of Dickson College, you should nominate for a position on the Dickson College Board. No prior experience is necessary. Nominations can be submitted to the front office from 11am on 1 February 2019 to 11am on 15 February 2019. Come along and enjoy this great exhibition of student work - visual arts, photography, ceramics, textiles, fashion, media and design. Opens Thursday 8 November at 6pm and is then open from Thursday to Sunday 10am - 4pm, until Sun 18 November. Welcome back for term 4! Year 11 students should make sure they have made their class selections for 2019 by this Friday 19 October. Term 3 ends Friday 28 September. Happy holidays everyone! Term 4 begins Monday 15 October. The closing date for class selections for 2019 is Friday 19 October. Year 11 students should ensure they have selected their Year 12 classes by that date. 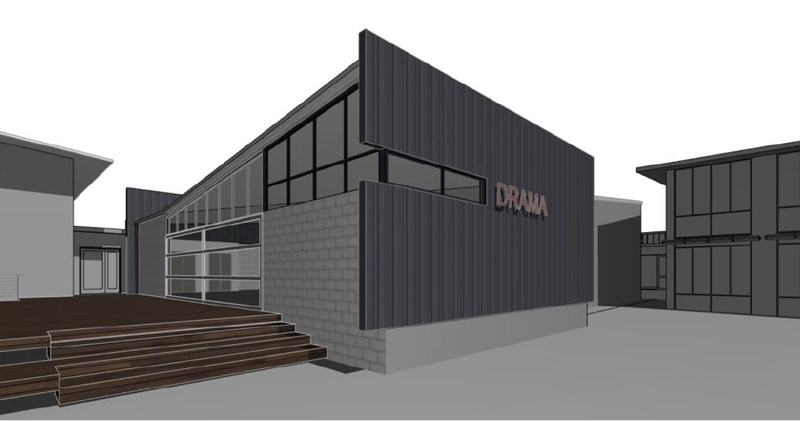 Following the redevelopment of the student gathering area adjacent to the canteen,the college is considering how best to develop the adjacent theatre and hall to accommodate drama and dance activities. A scoping study has been conducted and includes concepts to develop and confirm a design scope for this stage and to further develop the Master Plan from its initial phase. The objective of the next stage is to upgrade and extend the existing small theatre, back of stage area and investigate seating options in the hall to form a performing arts precinct. If you wish to find out more about the next stage of our Master Plan please come along to an information session on Monday 29 October at 6pm (Monday Week 3 term 4) at Dickson College. We are looking forward to Parent Teacher Night on Thursday 20 September. Parents and carers were emailed passwords on Thurs 13 Sept for making online bookings. between 16 and 19 years old in 2018 only. These immunisations will take place with visiting nurses at Dickson College. Students are to make their way to the Freda Ford Lounge during their free periods and break times on their allocated day. The AST (ACT Scaling Test) is a compulsory requirement for students intending to complete a tertiary package at college and thus receive an ATAR. There is a special assembly in the hall for students sitting the AST on Monday 3 September 2:40-3pm. We would like wish all students participating the best of luck! Year 12 T students are not required in classes after the Writing task on Wednesday. All Year 11 & Year 12A classes will run as normal. The Careers Team recently ran UAC information sessions for Year 12 students who are intending on applying for university and also for parents and carers. These sessions were aimed at assisting students in their university applications through UAC. The annual School Satisfaction Survey has recently been sent out for parents, carers and students to complete. The survey will be available for completion until Monday 3rd September. It is one of the most powerful tools for you to provide feedback to Dickson College, so that we can provide the most effective education possible. You will have recently received an email from ‘Dickson College Admin.’ that contains all of the information required for you to access the survey. If you are unable to access the survey online or require the survey in another language, please contact the front office for assistance. Health Team when they visit the school. can progress very quickly and can lead to death or permanent disability. vaccine protects against meningococcal A, C, W and Y strains. Students in Years 11 and 12 and the Connect10 program do not attend school on 9 August as teachers are attending Moderation Day at various venues. SIEC students attend as usual. Welcome back for term 3! Term ends Friday 28 September. Thank you to all the student volunteers, staff, prospective students and families. You made last night's Open Night such a success. Please find the link to our video presentation below. Visit Dickson College 6pm to 8pm to see the excellent programs offered here! The principal's address will be at 6.15pm. Visitors can tour the college and teachers and students will be available to answer questions about college programs and the curriculum. Delicious finger food will be served by our talented Hospitality students. Welcome back for term 2 on Monday 30 April. Seven weeks of classes and then exams 19 - 22 June. Term ends Fri 6 July. We are looking forward to Parent Teacher Night next week. It will take place in the Hall from 4pm to 8pm on Thursday 5 April. Interviews are for 7 minutes with each teacher. Mid-semester testing for maths, physics, chemistry, biology and oceanography will take place from Tues 3 April to Thursday 5 April. Wednesday 21st February is Meet the Teachers Night! Come along to have a chat with the teachers and hear from the principal, Craig Edwards. 5:30 – 6:30 (Canteen) - Meet the Teachers: a social event for staff, students and parents/guardians to meet. 6:30 – 7:30 (Hall) - Understanding Senior Secondary System: a more formal presentation with information for students and parents/guardians to understand the ACT College system and pathways options for students. This is just an introductory meet and greet event. For more involved discussions, please contact the school directly. The next Parent-Teacher evening will be held on Thursday 5th April. Year 11 students and other new students begin Monday 5 February 2018. Year 12 students return Tuesday 6 February 2018. Monday 5 February 8.40am: Year 11 Orientation Day. Meet in the canteen and collect orientation packs. The day begins with an assembly, Clubs and a mini timetable of classes. Enjoy the free BBQ lunch (includes GF and vegetarian) and information stalls. Tuesday 6 February 8.50am: Year 12 assembly. Year 11s should arrive at school at 9.30am when a normal timetable begins for all students. We wish all students a happy and successful year! If you are keen to contribute to the governance of Dickson College, you should nominate for a position on the Dickson College Board. No prior experience is necessary. Nominations are to be submitted to the school’s front office between 11am, 5 February 2018 and 11am, 19 February 2018. Nominations must be submitted during school business hours: 9:00am to 3:00pm, Monday to Friday. If an election is required, the voting period will be from 11am, 26 February 2018 to 11am, 5 March 2018. In the event of an election, a short biography of each nominee would assist with the voting process. You are therefore invited to attach a biography when submitting your nominee form. For more information, contact the Assistant Returning Officer, Dr John Clink on 02 6142 0140. Wed 22 Nov 9-11am: Handback Day. Students cycle through 15 minute classes from Line 1 to Line 8. Mon 27 Nov 9.30am: Year 12 brunch. Students are served a delicious brunch by teachers. This will be followed by the very important Year 12 package check. Students should check they have enough points for graduation. Appeals close 12pm. Course scores posted in faculties 2pm. Mon 27 Nov 6pm: Year 12 Formal at the National Convention Centre. Please see the front office for tickets. Wed 13 Dec 1.30pm: Year 12 Graduation Ceremony rehearsal at the AIS Indoor Arena in Bruce. ATARs will be handed out at the rehearsal. Wed 13 Dec 5.30-7.30pm: Year 12 Graduation Ceremony at the AIS Indoor Arena in Bruce. Students should collect their tickets as soon as possible from the library. Some special events this week celebrating the arts! Cabaret night Wed 25 Oct 7pm - Music, song, comedy, drama...come along and be entertained and enjoy some treats made by Hospitality students! Tickets $5 students; $10 adults. Fashion Parade Thurs 26 Oct 5.30pm - 6.30pm Creative clothing designed, made and modelled by our talented Fashion students. Art Exhibition Thurs 26 Oct 6.30 - 8.00pm - Wonderful artistic work from our Art, Photography, Graphic Design and Architecture students. The Elevate Study Skills program is running next Monday 23rd October 2017. All Year 11 students are expected to attend. There are three sessions: 10:40-11:45; 11.45-12.45 and 2.00-3.00. Two groups will run in each session, one group in the hall, the other in A13. To find your group, please see this PDF. This list is also posted up outside student wellbeing and the front office. If you have any questions, please contact Jason Abela in the IT office or see student wellbeing. Welcome back Mon 9 Oct for term 4! A busy term with some special events - 5 weeks and 2 days of classes and then exams begin Wed 15 November - Mon 20 November. Handback Day is on Wed 22 November. The Year 12 Formal is on Mon 27 November 6pm at the National Convention Centre in Civic. The Year 12 Graduation Ceremony is on Wed 13 December 5.30pm at the AIS indoor arena in Bruce. The Dickson College Arts Festival is coming up soon - Mon 23 October - Fri 27 October. Cabaret night Wed 25 Oct 7pm - Music, song, comedy, drama...come along and be entertained! Dickson College's talented dance class will be performing in the Ausdance ACT 2017 Youth Dance Festival this Friday 22 Sept at 7.30pm at the Canberra Theatre. This year's theme is Right Here. Right Now. Come along and enjoy a great night of dance! This Thursday 14th of September is R U Ok Day! Mental health is important for us all, and it is important to remember to stop and ask each other how we are. It is even more important to genuinely listen! In celebration of the day, come have a free sausage at lunch time on the deck outside the canteen. Then at 2.30pm Menslink will be here to deliver their Silence is Deadly Program, and we would love to have a big audience of men for them. This will be held in N32/34. We look forward to meeting parents and carers this Thursday. Reports were sent on Friday with login details to book interviews. If you have not received your login details please call Dickson College for assistance. Phone 6142 0140. Students do not attend college on this day as teachers are attending Moderation Days at other Canberra schools. SIEC students still come to school on Thursday. Come along and be entertained by our talented student film makers! Lots of fun and relaxing events are coming up this week, thanks to the efforts of the Student Leadership Group! Join in and stress less! 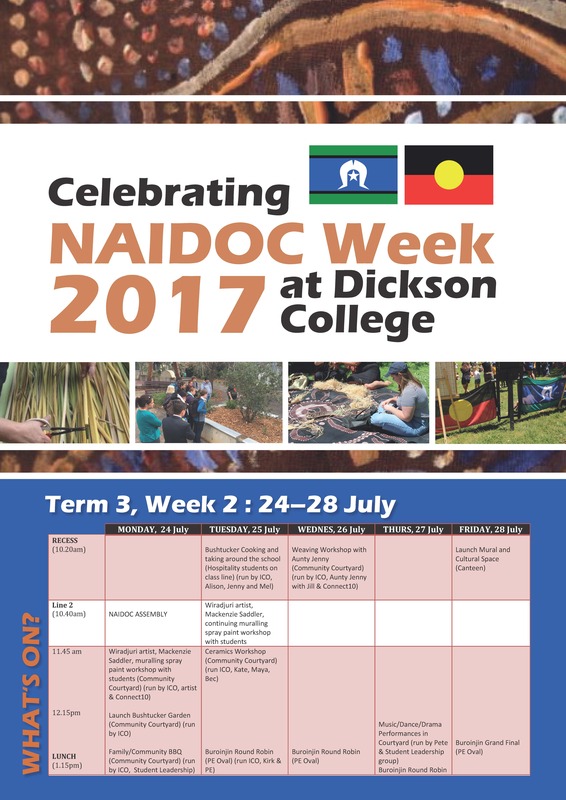 Here at Dickson College we are celebrating NAIDOC Week from 24 - 28 July, a little later than the national event due to school holidays. This year's theme is Our Languages Matter, highlighting the importance of indigenous languages. Mon 24 July 10.40am: NAIDOC Assembly in the Gym. Guest speaker is Michael Walsh, who will speak about indigenous languages. There will also be musical and dance performances, including an indigenous song by the student and staff choir. Mon 24 July 11.45am: Muralling workshop with Wiradjuri artist Mackenzie Saddler. Mon 24 July 11.45am: Bushtucker Garden launch by Tyronne Bell. Mon 24 July 12.15pm: Family/community BBQ in the courtyard. Includes kangaroo, beef and veggie sausages. Tues 25 July: Hospitality students will be serving bushtucker snacks around the college. Wed 26 July 10.20am: Weaving workshop with Aunty Jenny, using grass harvested from the Bushtucker Garden. Thurs 27 Jul 12.40: Music and dance performances in the courtyard. Fri 28 July 10.20am: Launch of mural and cultural space (canteen area). There will also be a buroinjin (indigenous football) round robin during the week at lunchtimes. We look forward to welcoming community members and students to our NAIDOC Week celebrations! Parent Forum Presentation: What Happens Next? Parent Forum on Careers & Transition Beyond School: What Happens Next? Was held Monday 29 May, 6:30pm in the Freda Ford Lounge at Dickson College. The end of semester is nearly here and there are a few things we need students to know including test dates, dates when students will get their new timetables, and what to do if they are not happy with an assessment process. Please note that if students have two tests on one day, they will need to sit them both, it is not a reason for special consideration/alternative test time. If students have three tests on one day, it is reason for an alternative test time and students will be able to sit the middle session test on Monday 19 June. There are only 9 students in this situation and we will email students with alternative test details soon. Students please talk to your teachers or year coordinators if you have any questions. The above information was also emailed directly to students on 4 June. Year 12 AST trial results have been emailed to students today. AST preparation workshops began this week. All Year 12 students planning to sit the AST are required to attend their AST Preparation class. If students are not sure what class they are in please check their email or the lists up in student wellbeing. Thanks for coming along and making Open Night 2017 such a success. If you missed out on a Guide for Prospective Students it can now be found on our website. This week all Year 11 and Year 12 students wishing to achieve an ATAR begin their AST Preparation Program with their first AST trials for 2017. Year 12 trials - Tuesday 9 May and Wednesday 10 May from 9am in the Gym. Year 11 trial - Thursday 11 May from 9am in the Gym. Given the success of the program last year, we are hoping to once again provide the best support possible to our students in preparing for the AST. Meet our wonderful staff and students and find out about the opportunities available at Dickson College. All welcome! Term ends Friday 7 April. School resumes Wednesday 26 April, after the Anzac Day public holiday. Easter (Fri 14 April - Mon 17 April) is in the school holidays. Have a happy and safe holiday everyone! One of the strengths of Dickson College is the strong commitment that parents have always shown towards enhancing the quality of our education programs, through payment of voluntary contributions. Thank you to all who have made contributions this semester. If you have yet to make a contribution, we would appreciate payment as soon as possible for semester one. Payments can be made by card in person or by phone, by cheque, online payment and also direct deposit. Log in to PTO (Parent Teacher Online) and make a booking. Parents and carers can book online until 12pm on 30 March. Passwords have been emailed to parents and carers. Please see the Help Desk on the night if you have forgotten to book. Staff can check to see if teachers still have times available. Meet the teachers at 5.30pm tonight at the college. This will be followed at 6.30pm by an information session and forum: Understanding the ACT Senior Secondary System. Procedures for extreme temperatures in place Friday 10 Feb. Relocate / rotate classes to other spaces that tend to be cooler e.g. ground floor etc. Provision of online work through Google classroom. It is lovely to have a couple of days of cooler weather but we can expect that we will have some more hot days before the end of summer. The College is utilising the building trust fund to support the replacement of blinds in classrooms and the provision of additional cooling in N Block (Special Education and adjacent classrooms and staff rooms). This project is planned to commence in the first half of 2017. We are all looking forward to Year 12 Graduation this Thursday 15 December at the Canberra Theatre! Students should arrive at 5.00pm for a 5.30pm start. The ceremony should finish around 7.30pm-7.45pm. Students who are receiving an ATAR should also attend the Graduation Rehearsal at 1pm at the theatre on Thursday 15 December. Congratulations to all our Year 12 graduates - see you at at the ceremony! Nominee Forms can be picked up from the Front Office during normal business hours (9am to 3pm Monday to Friday). Alternatively, request one via email from the Assistant Returning Officer. Nominations are to be submitted to the school’s front office between 11am, 30 January 2017 and 11am, 13 February 2017. Nominations must be submitted during school business hours: 9:00am to 3:00pm, Monday to Friday. If an election is required, the voting period will be from 11am, 20 February 2017 to 11am, 27 February 2017. Due to the power outage on Thursday afternoon. Semester 2 College reports and student timetables for 2017 will now be distributed via email on Monday 12 December. Year 12 - Final checks! Congratulations on getting to the final step to finishing Year 12! 5. Check that you meet BSSS requirements in terms of points, majors/minors – requirements are below. 6. If you have concerns that are related to special considerations, please contact your year coordinator. ** If you have moved to Dickson from another school, you must complete at least 10 points at Dickson to meet BSSS requirements. ** If you have moved to Dickson from another school, you must complete at least 8.5 points at Dickson to meet requirements. Appeals close on Monday 28 November at 12PM. If you are not happy about a score or a grade, you must act quickly as timelines are very tight at the end of the year. If your concerns are not allayed by the executive teacher’s response/action please speak with Juliette Bornas, executive teacher of Assessment and Certification. Juliette will discuss your concerns and explain the procedure for a formal appeal if you wish to proceed further. We are rapidly approaching the end of the year and there are some key dates and events you need to be aware of. I am encouraging all students to take care during end of year activities and to always look out for their friends. End of semester can be a stressful time so I also encourage all students to take measures to ensure they are looking after their wellbeing and getting enough sleep, exercise and good nutrition. Tuesday next week (14th) will be the last day of normal classes for this semester. On Wednesday (15th) the end of semester testing period begins. All students need to make sure that they arrive at their test 10 mins prior to the scheduled starting time. If a student is absent for a test they must notify the College on the day and have appropriate supporting documentation (i.e. medical certificate) to explain their absence. If a student is late for a test, without a legitimate reason, it will be expected that they will commence their test straight away and will receive no additional time. Please see attached policy on test absences for more information. This workshop is free, morning tea and lunch will be provided BUT places are limited. Students need to sign up at the front office by 18 November to reserve your place. 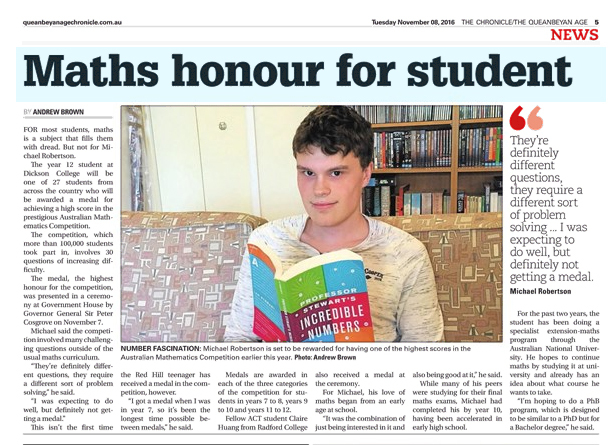 Congratulations to Michael Robertson (Year 12) who was presented with a Mathematics Medal by the Governor General, Sir Peter Cosgrove at Government house on Monday afternoon. Out of the 22,000 students participating in this competition nationwide only 27 receive medals. Michael was the only ACT student to receive a Senior Medal. Well done Michael! Year 12 students: Don’t forget to secure your tickets for the Dickson College 2016 Year 12 Formal, Monday 28th November. Tickets can be purchased at the front office. "The New Voice Scholarship is a fabulous opportunity for skilled and motivated educators to be recognised by their peers. ACEL is committed to giving-back to the profession, through the provision of world-class learning opportunities for up-and-coming leaders, and we are thrilled to welcome the 2016 Scholarship winners into the ACEL network. There is also opportunity to have their voices heard through ACEL Publications and at events. All winners of the New Voice Scholarships were invited to write for the special issues of Perspectives, where they consider the following topic, with no limitations or directions, if you were able to transform education (given a metaphorical magic wand), what would you do? These perspectives are, like our New Voice Scholars contexts, diverse and inspiring. I hope these articles challenge and inspire you to reflect further." This week we are celebrating Dickson College’s 40th Birthday with many exciting events happening at the school. Please note: No classes will be held in last period (line 6) next Friday 28th. On Tuesday 25th our celebrations will kick off with a Trivia Night to support homeless and mental health services in Canberra. Tickets are $15 per person (book at: www.dc-trivia-night.eventbrite.com) and $10 for students when purchased at the front office. On Thursday 27th the Mighty Cabaret…Thing! will showcase a range of music, dance, and drama acts from our talented students. The Cabaret will be held at the college hall at 7pm. Tickets are $10 per adult, $5 per student, and can be purchased from the school. On Friday 28th we are hosting an Open Afternoon from 3pm, with cake cutting at 4pm. All parents, friends, ex-students, and ex-staff of Dickson College are invited to celebrate our Ruby Jubilee. Student art work and music from school bands will also be on display. This will be followed by a Fashion Parade at 5.30pm and an Arts Exhibition at 6.30pm in the hall. We are also selling tickets for a major raffle to be drawn at the Arts Exhibition on Friday. The raffle prize is for four nights at 4 ½ star Sea World Resort & Water Park on the Gold Coast for two adults and two children including unlimited entry to Sea World, Warner Bros Movie World and Wet ‘n’ Wild Gold Coast, also including a $200 Caltex Cash Card and $100 credit for food and beverage at Sea World Resort and Water Park. And finally we launching our Innovation at Enterprise initiative called 100 Bright Ideas for DC – so if you have an idea for what we might wish to do it the future please contribute it here. For more information, to book your tickets to the Trivia Night and Cabaret, and to buy raffle tickets, please call the college on 61420140. In 2016 Dickson College celebrates it's 40th Birthday. The College is acknowledging this with a range of celebrations taking place from 24-28 October. This occasion is a great opportunity for our College to reflect on the past but also think about what opportunities we might want to encourage for the future. Opportunities that will potentially benefit our students, staff and broader community. So...right now at DC we are looking at how we might turn an idea into an innovation? To contribute your idea please follow this link. Please follow the links to see which classes will be offered by each faculty and a description of what the class is about. Study skills is also offered to all students. This is a support class for any student who needs help keeping on track with assessment/time management/managing College overall. ESL tutorials are offered to all ESL students. Gmail – enter your school email address (ID#@schoolsnet.act.edu.au) then log in with the same username and password as you do on the school computers. STEP 3: Select subjects you want, in order of your PREFERENCE (Important). Step 4: Follow the instructions once you have logged in to choose your classes. If you need advice about which classes to take, please talk to the teachers from the faculty that the class is in and then if you still feel that you need advice, make an appointment with your Year Coordinator. If you are having trouble logging on, please go to N37 between recess and lunch and the Study Skills teachers can help you. All Year 12 students are invited to a free, tasty breakfast hosted by teachers from Dickson College! Wednesday morning, 23rd November, at 8am. Term 4 starts Monday 10 October. Invitations to Graduation will be emailed to parents and carers in the week after the school holidays (from 10 October). Parents and carers should RSVP to the email. All graduating students are given 1 ticket for themselves plus 2 guest tickets. Extra tickets may be available from 14 November. Tickets can be collected from Dickson College library in the week beginning 24 October. Printed invitations can be collected from the library for those without emails. Please contact Lindy Hathaway in the library on 6142 0146 if you have any queries. We look forward to this important event! Dickson College's 40th birthday celebrations! 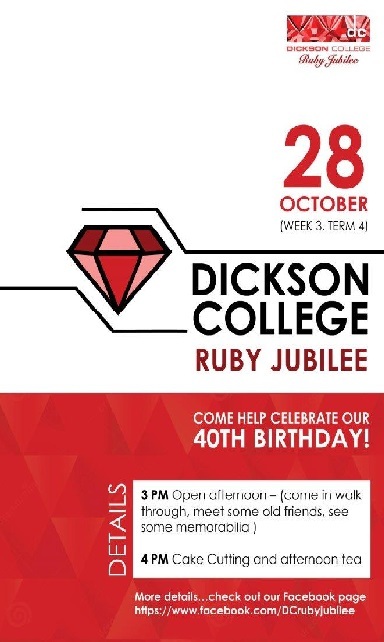 Don't miss these special events for Dickson College's Ruby Jubilee! Trivia Night - Tues 25 Oct 7pm-10pm - Halloween theme! Dickson College’s Writers' Camp is on again! All the best to our creative writing students who will spend Wednesday to Friday this week at Birrigai. Here they will hone their writing and creativity skills with some of Australia’s better known writers and authors including Sean Williams, David Henley, Julie Koh, and of course, our very own Toby Grundy. The Dickson College Canteen is now offering online ordering through Flexischools. Please see the Flexischools website for more information https://www.flexischools.com.au/ . What: A forum on mental health. RSVP necessary. Please see flyer for more details. Welcome back for term 3 - Mon 18 July to Fri 23 Sept.
Our Assembly in Clubs on 18 July will celebrate indigenous history and culture and NAIDOC Week, which fell during the school holidays. We have a guest speaker, student hosts and student performances. See you there! An astronomical teaching facility at Mount Stromlo is being established. This facility will be available for use by public high school and college students from across the ACT. Called the McNamara-Saunders Astronomical Teaching Telescope (MSATT), MSATT will be available for students wanting to undertake higher level student-centred projects in astronomy and astrophysics. The anticipated time of completion is June 2016, with MSATT being made available for students from around September. Full implementation for student projects will be from the start of the 2017 academic year. Click here to view the poster for this exciting opportunity. The timeline for 2017 enrolments has been released by the Education Directorate. To view this document as a pdf, please click here . To view this document in Word, please click here .